Dies R Us: Quiet Night! Wednesday has rolled around again & it's now my turn to share with you again. Today I have another Christmas card. Like most of you, I have been busy working on them for several weeks now. Although I dearly love coloring, I have to admit that making cards with nothing but dies is also fun & very addicting! And so much faster!! 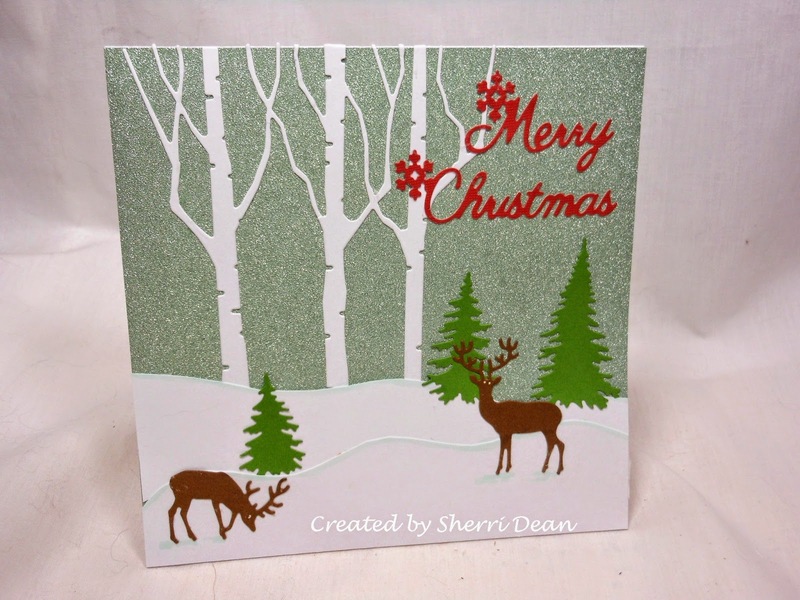 For today's card, I used these dies: Impression Obsession Evergreen Trees, Memory Box Birch Tree Trio, Cheery Lynn Merry Christmas Sentiments, & Impression Obsession Small Deer. I chose some beautiful aqua glitter paper for the background. I wanted the beautiful birch trees to reflect against the starry feel of the glitter paper. By cutting some "hills" in my white cardstock, I was able to give the effect of snow for these beautiful deer. It's amazing to me how you can create a beautiful scene just by dies alone! It's time to go through your dies, friends & see what you already have that might create a scene of your own. And also to check to see what dies you want to add to your own collection! Don't forget to check out our Dies R Us Challenge Blog too, everyone! You still have a couple of days before the next challenge begins on the 15th! I know you will be back tomorrow to see what Robin has for you. I've already peeked, and you won't want to miss it!! Catch you again next Wednesday! Until then, happy crafting! LOVE the serene scene you have created Sherri! A lovey scene created with nothing but die cuts...my kind of card! Love the background glittered sky and the snowdrifts created with the torn paper. Beautiful job Sherri!